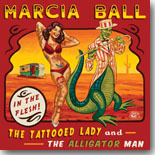 Marcia Ball has probably garnered more Pick Hits than anyone else in Blues Bytes history, which isn't surprising since everything she puts out is simply fantastic. The same can be said about this month's Pick Hit, The Tattooed Lady and the Alligator Man. Our Surprise pick for the month, Bootleg Whiskey, comes to us from prolific Mississippi artist Grady Champion. We go back 20 years for this month's Flashback featuring, taking another look at William Clarke's most excellent Groove Time. Our What's New section features reviews of new CDs from Sena Ehrhardt, Big Heart George, Etta Britt, Laura Rain and the Caesars, Generation Blues Experience, Markey Blue, Larry Garner, EG Kight, a tribute to Gregg Allman, and more, plus another look at last month's Pick Hit from Mud Morganfield & Kim Wilson.